In order to understand the process at which diabetes can be reversed, we need to understand what exactly the disease is. Diabetes is a disease in which glucose, or sugar levels, are above normal in the blood. Most of the food we eat is turned into glucose that our bodies use for energy. The pancreas, an organ that lies near the stomach, makes a hormone called insulin that helps glucose get into the cells of our bodies. When you have diabetes, your body doesn’t make enough insulin or can’t use its own insulin as well as it should. This causes glucose to build up in your blood. There are several types of diabetes. In type 1 diabetes the body does not make insulin. In type 2 diabetes, the body does not use insulin well and may not make enough insulin. This is the most common form of diabetes. Gestational diabetes happens when a woman’s body does not use insulin well while she is pregnant. It raises her risk for type 2 diabetes and raises her child’s risk of getting diabetes. Diabetes is serious. 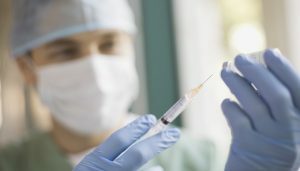 Over time, high blood glucose levels may cause many health problems including heart disease, blindness, kidney failure, and foot sores and amputations. The health industry, just like any other industry, is just that; an industry. And the sole purpose of any giant mainstream industry is to increase profits. How does the health industry make money? They need more and more unhealthy people each year who will buy their products. What would happen if people became healthy, and happy? That’s right, the whole industry would collapse overnight, and all their billion dollar profits would disappear. Drugs and pills are not made to cure you. Their goal is to relieve your symptoms to make you FEEL better and trick you into believing it worked. They run an industry to increase their profits, they do not want you to become healthy and slim, and their billions of dollars depend on you staying sick and unhealthy. I want to dispel all the mystery and confusion and bring you to the foundation of your TRUE health and wellbeing. 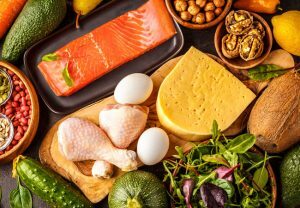 Countless scientific studies (which I will get to later on) over the years have proven that simple dietary and lifestyle changes work much better than conventional methods involving drugs and surgery and without the side-effects. When you take drugs, you still LIVE with the disease you are treating. You still LIVE with the side-effects from the disease while throwing away your money on pointless drugs.When you start eating right, when you eliminate the harmful oils, fats, and foods, your diabetes goes into remission and overtime even disappears – and with it disappear all the horrible side-effects. Without the use of drugs, pills, surgery or And trust me, you are going to be quite angry when you see for yourself what the drugs and pills that you might be taking really do to you – and why you never even had to take them in the first place. Don’t let your doctor fool you…. We are told that this is a chronic and progressive disorder. That means that once you develop type 2 diabetes, you’re going to have it for life and there’s nothing you can do about it. You’re going to be on medications, you’re going to be on insulin and then you’re going to develop the complications. Blindness, nerve damage, amputations, heart attack, strokes, kidney damage, dialysis… The whole works… it’s inevitable. But is it really? Imagine a world where type 2 diabetes is a simple reversible disorder where a simple dietary manoeuvre can reverse your diabetes in a matter of weeks. The American Diabetes Association of course disagrees. They say right on their website that it’s a fact that for most people type 2 diabetes is a progressive disease. So you might as well forget about it. Don’t even try to get better, it’s hopeless. They’re telling you there’s no hope. But we can look at certain examples and we can see that this is actually not true at all. Let me give you some of these examples – bariatric surgery. 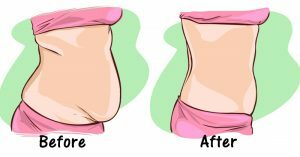 Bariatric surgery is also called weight loss surgery or stomach stapling. What they do is they take your stomach and they cut it to the size of a walnut, so you really just can’t eat. Because you’re not eating, you’re going to lose a lot of weight. But what happens to the diabetes? Well let’s look at this study here. In this study they randomized two groups of people. One group of people stayed on their medications and got the best medical therapy available. The other group got weight loss surgery. On the horizontal axis is time over 12 months. On the vertical axis is the number of medications that these people were taking. You can see that the number of medications that people took while doing the best medical therapy available, really didn’t change. They kept taking the same number of medications, they’re really no better than they were when they started. Than they were at the end. But look at the weight loss surgery group. Very quickly within a matter of months they’re coming off all their medications and it keeps going. By 12 months many of these people are off of all their medications and their blood sugars are completely normal. That’s amazing! Wasn’t this a chronic and progressive disorder? Wasn’t this a disorder where there’s no treatment and there’s nothing you can do, it’ll get worse? Well not really, not according to this study. It looks like diabetes is a disease that’s reversible. But better than that, it’s quickly reversible. And even other types of weight loss surgery, such as gastric banding, have the same benefits. 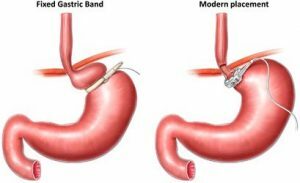 Gastric banding is a procedure where they put a belt inside your stomach and tighten it so you can’t eat. And again what you see here is that the diabetes very quickly reverses and it stays gone. So this is not a chronic and progressive disorder, this is a reversible disorder. I’m not saying that gastric banding or weight loss surgery is the answer for everybody, but it simply points to the fact that the situation is different and this is a reversible disease. Let’s look at another example. We can look at fasting. Fasting is a dietary maneuver where you don’t eat anything for a certain period of time. I had this patient here, Richard, who came to me for treatment of his diabetes. He had been diabetic for 10 years, he was taking about 70 units of insulin and he was developing complications. He was getting eye disease, he was getting kidney disease. So we changed his diet, we put him on a low carbohydrate diet and we gave him some simple tips and we included some intermittent fasting in his regimen. Over a period of months he lost about 60 pounds. And his diabetes got incredibly better. So what happened was that he had been using fasting for two years and he thought it was so amazingly great that it’s going to be obvious, everybody is going to know this. There were a few problems of course. 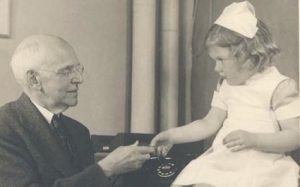 At the time he didn’t differentiate between type 1 and type 2 diabetes. Well, it’s very beneficial for type 2 diabetes, it really doesn’t impact type 1 very much. And with the discovery of insulin a few years later all focus shifted to insulin and everybody forgot about these dietary therapies. Recently in the United Kingdom Dr. Taylor performed a study called “The counterpoint study” and there he put people on very low calorie diets. Well, it’s not fasting, it’s very close. And look at these results. In this group the blood sugars went from to in seven days. Seven days! His sugars have gone back to normal. What happens with this idea that it’s chronic, it’s progressive, you’ll always be on medication? It’s simply not true. There’s another example we can give. We can look at the example of very low carbohydrate diets, or so-called ketogenic diets. Let me give you a case – I had a 29-year-old graduate student, she was actually studying chemistry and she was recently diagnosed with type 2 diabetes. Her hemoglobin A1c was 10.4%. This is a three-month average of her blood sugars. The diagnosis of diabetes happens at 6.5%, so 10.4% is very high. Her doctors were very concerned of course and started her on four medications right away. Being only 29 she didn’t want to stay on medications for the rest of her life. So she looked on the Internet and decided that she would follow a ketogenic diet. Well, she very quickly lost about 20 pounds and at her three-month check-up, her hemoglobin A1c was 5.5%.Well within the normal range and clearly not diabetic. Better she had taken herself off of all the medications as soon as she started. So in this case it looked like her type 2 diabetes was essentially cured. Wow! That’s not what we are told. Right? But we all know this is true. 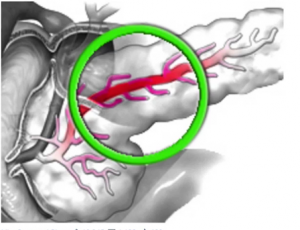 We all know that the type 2 diabetes is completely reversible. For example if somebody comes up to you and says, “You know what? I lost 50 pounds and my diabetes went away.” You’d say, “Wow, that’s great! Terrific, good for you!” You wouldn’t say to them, “No, you’re lying to me. “The American Diabetes Association says it’s chronic and progressive. Get back on your medications!” No, of course not. So, it’s immediately obvious that this is just a lie. Type 2 diabetes is not chronic and it’s not progressive. It’s reversible. I’ve seen dozens of patients and that doesn’t happen. So in those cases the diabetes is not cured. So actually there are treatments that lead to a cure and there are treatments that do not lead to a cure. 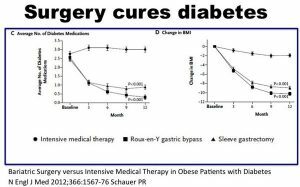 So those that lead to a cure – bariatric surgery, fasting and very low-carb diets And these treatments do not lead to a cure – insulin, other drugs, a low-fat diet. You can also learn about simple foods that can help cure diabetes from the video below. You’ll never guess of course which direction all our current treatment protocols and research are heading to. They’re all heading towards the path of no cure. And that’s why, they tell you – it’s a chronic and progressive disease. But it’s not. This is amazing news. This is amazing because type 2 diabetes is in fact a curable and reversible disease. The fact that treatments exist, means that there is hope for all of us. Drugs however cannot cure a dietary disease. The cure must be a diet. The right diet. HOW TO INCREASE METABOLISM-How to Turn Your Body into a Fat Burning Machine! How Many Calories and Carbs in Bananas? Copyright © 2019 www.completebodycleanse.org. All rights reserved.